The twin designers at Dsquared2, Dean and Dan Caten, turned their show into a prison cell. Bad boys have always been their inspiration, so it wasn’t surprising to see them go this route; at least for me. While they offered cool quilted jackets (in vivid orange for rebellious assurance), silk prison suits, button-down shirts with cell numbers and sweaters embossed with “Caten’s Penitentiary,” denim was the soul that hold these collection together. They know how to cut and sew a pair of denim like no other, giving it a modern twist to them, as were their distressed, bleached, and loosely yet tailored jeans, and youthful denim jackets. But they proved they also have an understanding for tailoring in outerwear, such as in one luxurious dark cherry coat that was noteworthy. The clothes in reality had potential for its most loyal customers. Supreme masculinity and sensuality. That’s what Mr. Giorgio Armani sent out for his men’s fall 2014 collection. He delivered what may have been one of his best collections to date in sumptuous body-hugging suits (mostly in gray shades, navy, and black) that defined the torso – man curves - and shoulders. This was a weapon where one could appreciate the male physique of someone who devotes time to the gym. He styled these suits with classical white shirts buttoned to the neck, no tie, and waistcoats that made every model even more masculine. It was pleasing to see him take another route where relaxed clothes used to be the protagonist – loosely fitted trousers and straight jackets – and instead opt for impressive garments where slim dominated the runway. Even outerwear was desirable in soft furry coats, asymmetrical color-block jackets, and cardigans that were cut to simulate a biker jacket. Some more relaxed drawstring trousers (cut perfectly) paired with invigorating knitted sweaters were more manly than boyish. And for evening, Mr. Armani decided to go for rich velvet jackets worn over simple t-shirts and waistcoats I thought looked stunning for such a look. In general, these clothes stated power in a mien casual manner where sometimes all a man needs is a great quality fabric, texture, and a hint of tailoring to execute a look. Mr. Armani delivered all of these three exquisitely well. I’ve always been a big fan of Roberto Cavalli. There is always something fresh and dandy about what Mr. Cavalli has to offer, it simply feels right to splurge some money on his collections. Whether it’d be in a lustrous jacquard party suit, embroidered white shirt, or seductive outerwear jackets, the designer seems to have everything put together. But his latest fall men’s wear collection didn’t transmit much desire for the first time. 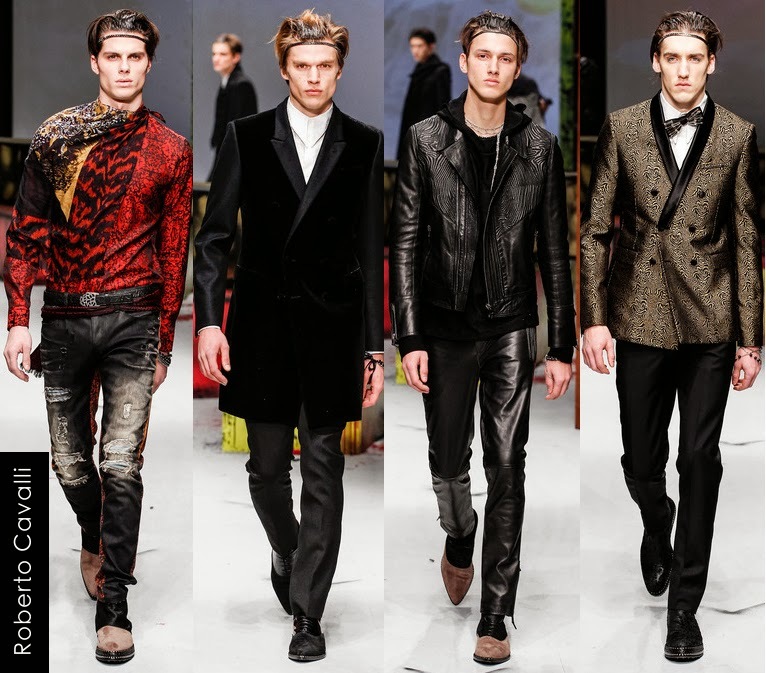 Lately, Mr. Cavalli’s son has been taking over the men’s collection, but for this one he explained it was all his own ideas. There were some of Cavalli’s signature codes present: animal print shirts; metallic jacquard suits and embellished sweaters; convincing distressed denim pants that were worth the look; engraved leather numbers; and those rebellious vintage accessories in scarves, bracelets, and color-block shoes. It wasn’t such a tedious collection, but there was something missing here………seduction. It was present at around the end of the show in his slim-tailoring velvet suits and gold jacquard suits - in single or double-breasted - worn with embroidered white button-down shirts every man should have one of. Yes, there were still items to spend on next season, but not a collection to lust for like in previous seasons. 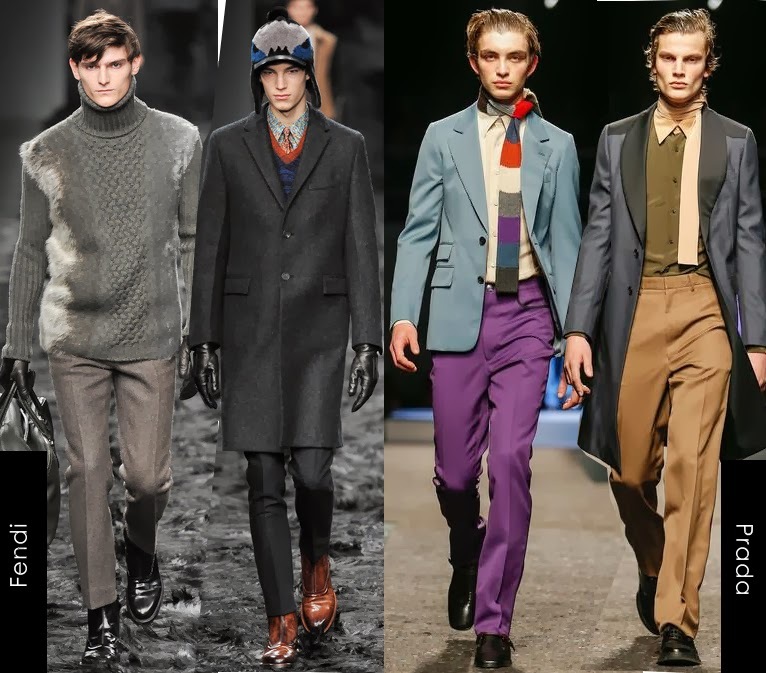 Meanwhile, it was Fendi and Prada who brought practical innovation and fashion throughout the whole Milan men’s fashion week. At Fendi, Silvia Venturi Fendi, scored high notes with her energetic hybrid and urbanwear clothes. What was just an ordinary knitted turtleneck, she took the time to experiment with it and develop a surreal needle punched fur-shearling piece that looked extraordinary – in a luxury status - worn with ultra slim trousers. And she may have been the only designer who played with luxury in the most sophisticated and quirky manners. Outerwear was her sweet spot, which was full of fresh ideas: a one-in-all camel cashmere, leather, and shearling collar jacket; a superbly played fake crocodile jacket that was actually stamped leather; long and lean tailored coats in intricate wools; leather jackets with magnified stitches you could understand its cut; and more thick furry coats only Fendi is a master at. And even better was the fact that outerwear here were reversible in many cases. Suits were kept slim and single-breasted worn with chromatic knits and un-tucked buttoned shirts. Important noting also were her wacky ear-long hats that are sure to be a sensation among her young audience, together with her appealing high-top sneakers and glossy shoes. This collection was without a doubt on spot – tailored and very youthful – for the customer who hasn’t had a clue yet on what to spend his money on. Miuccia Prada seems to be the only who speaks wearable fashion. While most designers are convinced sportswear is the next moving trend, Ms. Prada wanted to show off her tailoring skills in the most appropriate and living colors for fall – purple, red, camel, powder blue, and sage. She staged her runway on what seemed to be a theatre where models had either finished acting or on a break before the show. That’s what I love about a Prada show. There’s a story to be told, and unlike her last romantic and powerful spring collection, this was toned down drastically but even more marketable besides her skinny scarves (or ties) wrapped around the neck of every model to compliment a new color scheme. 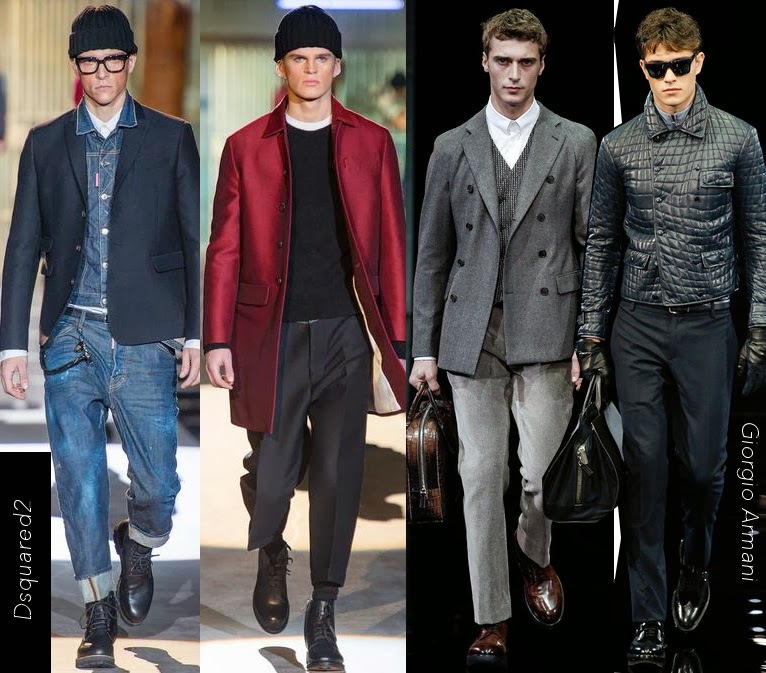 There were options to either go for loose fitted trousers or slim ones worn with nicely tailored suit jackets, luxe buttoned-down shirts or mesh tank-tops, and glossy sneakers that broke the code of formality. Severe casualty is what conceded in a 70s silhouette. Kitsch were her fur numbers that could appeal to her extreme Prada follower. While for outerwear, long lightweight wool coats were the solution. This collection depicted once more why Ms. Prada is so successful. She doesn’t follow a trend, she sets the trend. And color was her new provocation.